Mango Twist is my another fusion recipe. This is look-a-like a mango shake but with twisted version. A delicious mango twist is cool and refreshing drink. This rich drink makes your day perfect. 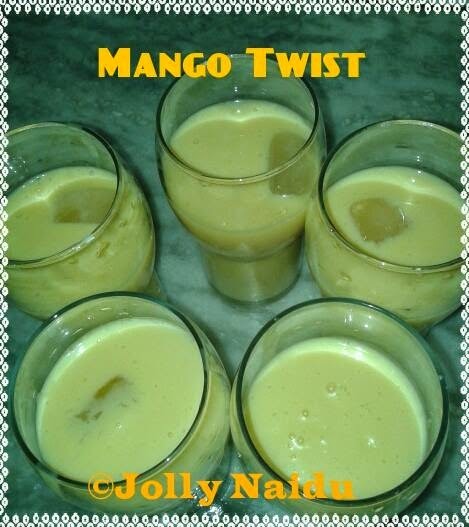 Instant mango twist made with milk, ripe mango and other interesting ingredients. This is instant breakfast meal also. I hope you'll all like my fusion. Let's check out this special ingredients below in the recipe. 1. For mango twist, peel the mangoes and dice it into cubes. 2. Blend the mangoes, water, sugar and mix well to make like a puree. 3. Now add milk, lime juice, vanilla essence, cardamom powder and mix till smooth. 4. Mango twist is ready. Serve it with ice-cubes in each glass.